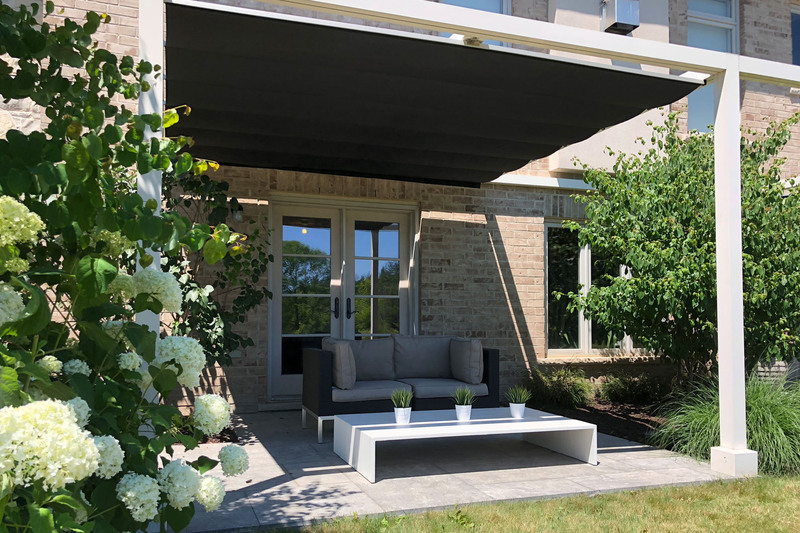 The charming community of Campbellville sits within the town of Milton, amongst the beauty of the Niagara Escarpment and surrounded by all mother nature has to offer. Its rich cultural heritage has helped cement the community’s place as a popular tourist destination in the Greater Toronto Area. Campbellville’s rustic setting provides a backdrop for ice-cream parlours, Mennonite furniture stores, and lauded antique shops dotted around its quiet streets. Campbellville inspires its residents and visitors alike to spend time outdoors, soaking in its sun, sights and well-preserved antiquity. This was the mantra of these homeowners who had their own personal piece of nirvana in their backyard. 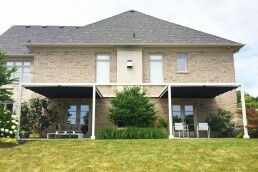 The traditional two-storey house was built to incorporate outdoor living. 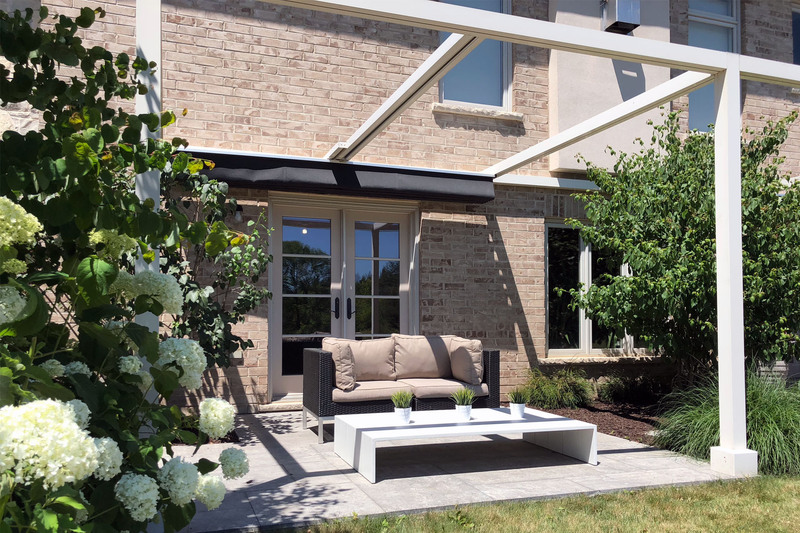 Two French doors at the back of the house open out to separate patios: one houses a small seating area where they have their morning tea and coffee, while the other is home to lounge furniture perfect for bird-watching and relaxing in the afternoons. 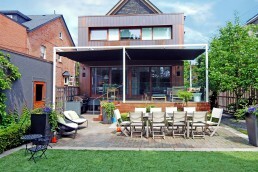 However, the sun or rain constantly hindered the homeowners’ plans of relaxing in their backyard retreat. 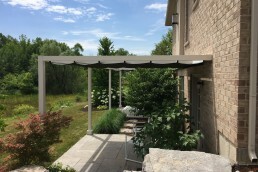 Desiring a unique and versatile shade solution that would tie in both patio areas without compromising the growth of their thriving gardens, the homeowners specified the need for a sleek and modern structure that could be attached to the house. 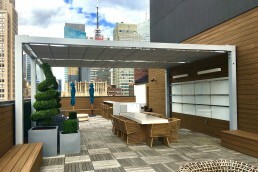 Working with ShadeFX, three symmetrical structures were customized for the 400 sq. 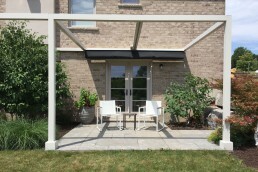 ft. outdoor space. 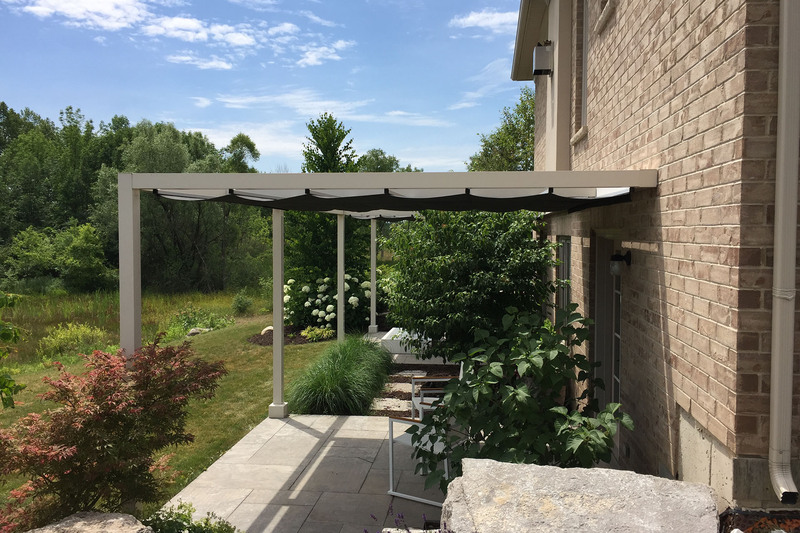 One 12’x12’ motorized retractable shade unit was installed above each patio, leaving the 10’x12’ garden area open so the plants could take in the needed sunshine and rain. 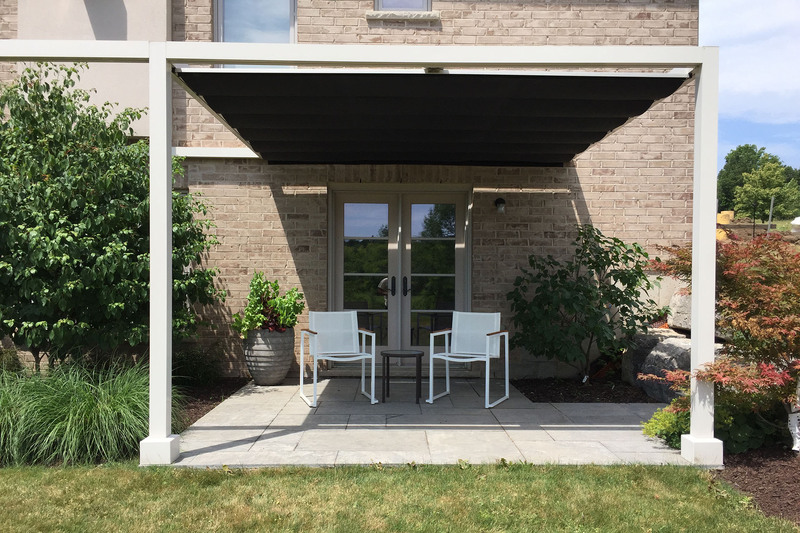 Three spaces, two canopies and one structure later, the homeowners now have a multifunctional outdoor solution that cohesively ties all the spaces together. One that they can enjoy for many years to come. Need a dynamic outdoor solution for your backyard? We can help. 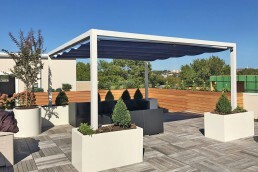 Desiring a unique and versatile shade solution that would tie in both patio areas without compromising the growth of their thriving gardens, these homeowners specified a sleek and modern structure that could be attached to their house. Three symmetrical structures were customized for the 400 sq. ft. outdoor space. 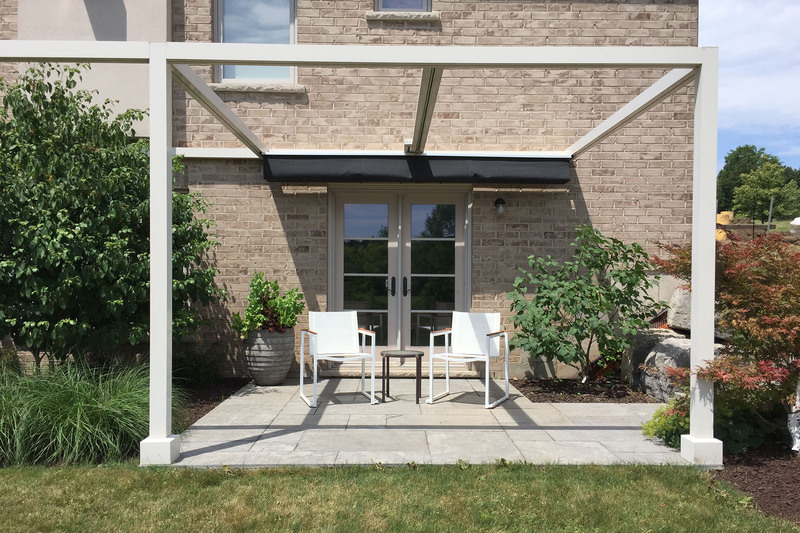 One 12’x12’ motorized retractable shade unit was installed above each patio, leaving the 10’x12’ garden area open so the plants could take in the needed sunshine and rain.